Mimictec, the AgTech startup set to revolutionise poultry farming in Australia, received $450,000 investment that will see their robot chickens go to market early next year. 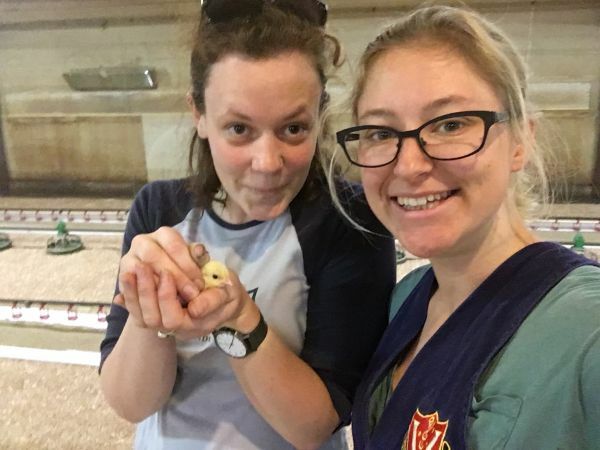 Established by Master of Entrepreneurship grads Eleanor Toulmin and Sarah Last, MimicTec's product 'PeckTec', in development since 2016 aims to reduce stress and decrease the mortality rate among young chicks and improve feed conversion and growth metrics. PeckTec mimics the role of a mother hen to help chicks learn how to survive in the crucial first days and early trials support significant efficiency gains for the poultry industry. Over the past two years, the team of two has undertaken product development, prototyping, testing and market research to deliver a robust product that will make chicken farming more profitable, and more ethical. We caught up with Eleanor Toulmin to find out more. How did you come up with the concept of 'PeckTec'? The eureka moment actually came from my co-founder Sarah. She spent 15 years working on a farm near Pearcedale, Victoria that rears and rehabilitates exotic birds - macaw parrots and Javanese peacocks. She was already rigging together nests in eskies, as well as feeding and monitoring systems. We met at Wade Institute doing our Master of Entrepreneurship and slowly the idea developed. We picked up on what she had created for the exotic birds to address significant concerns in chicken farming. You say PeckTec is rooted in your passion for animal welfare. Can you explain how this benefits the chicks? Between one and two per cent of chicks on commercial farms die in their first week of life, largely because they don't figure out how to eat or drink. Pecking is instinctual, but without maternal care to teach them to direct that pecking towards food and drink, many chicks don't work it out for themselves. We're providing an option for farmers to reduce their feed and maintenance costs, while also creating a better and safer environment for the chicks. It certainly is a tall order for farmers to double the productivity of their farms every generation to remain profitable. How does your product help? It is such a huge ask, and so important that farmers are given a number of different levers to pull to improve productivity, sustainability and profitability. Our product aims to improve the productivity of chicken farm by improving the welfare of the farmers' chickens. We just finished a 50,000 bird trial split into two sheds - one treatment shed with our PeckTec equipment and one control shed. The birds in our shed used 10 per cent less feed than birds in the control shed. In livestock farming we talk about feed conversion - that is the amount of feed required to produce a kilo of meat. Our control shed had a feed conversion ratio of 1.68 - that is 1.68 kg of feed for 1 kg of chicken. This is already incredibly efficient. But the chickens in our treatment shed had a feed conversion ratio of 1.52, which blew our minds. Feed is often 60 per cent of a livestock farmer's costs, so decreasing that by 10 per cent wipes six per cent straight off their bottom line. We are running the trial again to ensure it can be replicated. Your seed funding from Scale Angel Investors in an important step in bringing this to market. What do the next few months look like for you and Sarah? It is really important for us to be able to stand behind our product. We need to ensure that it will work as well for the farmers as we have seen in our trials. We will run additional trials to build out the data set and proof points. A ten per cent improvement in feed is jaw dropping and something we want to make happen again and again. The funding we've received from Scale will primarily be used on manufacturing and in February we will make PeckTec available for sale. We're so grateful to Scale because they really get behind female entrepreneurs, who internationally receive less funding than men. For example, last year, in the UK two per cent of seed funding for start-ups went to companies founded by females. Even though there is evidence that female-founded start-ups generate more revenue and do so with less funding. Schemes like Scale are crucial, not only to tip the scales in favour of female founders, but also in favour of good business and investment decisions. It sounds like your days and nights are busy with MimicTec. What do you do to switch off? There is always a little part of my brain thinking about MimicTec so carving out some me-time is really important. Every Wednesday I play board games with a big group of friends and I also do indoor rock climbing. I find them both really helpful for different reasons. Playing big, strategy board games (e.g. Scythe, Pandemic, Dominion, Terraforming Mars) improves your decision making skills, your ability to weigh up options and bounce back from mistakes, as well as your ability to see the big picture. I've been playing board games once a week for six years and these are the changes I've seen in myself. As for indoor rock climbing; it's just so different to running a start-up. A start-up is a marathon, not a sprint. So, the wins are often months apart, and your day to day can sometimes feel like a real grind. Rock climbing is great because I can feel myself getting better. Every time I get to the top of a new wall it's a huge sense of achievement and excitement. It's quite addictive actually but also really good for the body and soul.